1843. Seal of Colony instituted. Local scene is of the water-front where three local merchants and a pile of merchandise are left fore-ground, and a square-rigged ship and a junk occupy the middle-ground. The back-ground has small conical hills with a larger one to the left above the merchants. 1868 Flag produced with badge based on "local scene" of Seal, but not liked by Governor. 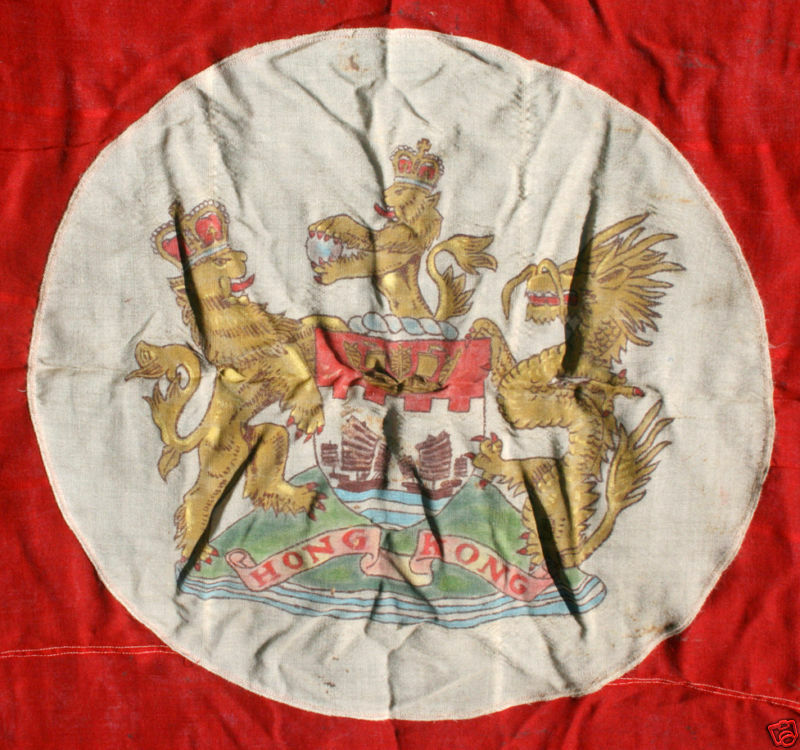 1870 "White crown over HK" proposed by Colonial Secretary 1873. Letters HK omitted and crown in full colour. 1871-1876. It is not clear what the badge was during this period except that it was not the "local scene", but was a crown of some sort, which may, or may not, have had the letters HK below it. 1876. Seal badge re-adopted with Admiralty approval. 17th November 1923. In reply to a question about white circles on colonial Blue Ensigns, Governor wrote that, "the dark green of the Peak would be against the blue of the Ensign". The Colonial Office queried the "dark green" writing that the border of the badge should vary from light blue to light brown and white. 12th May 1924. Governor wrote that the badge in the Flag Book, "has for some years past differed from the flag." "Flag, that was even less attractive than that in the Flag Book, would be changed to correspond to it." 1955. Seal badge revised. Similar to the 1876 badge but with a slightly lower eye-line, and more realistic left-hand mountain which, together with the ship and junk, was made more prominent. Arms granted 21st January 1959. 1959-1997. Arms on white circular ground on UJ and Blue Ensign. Also on unauthorised Red Ensigns. Flagmaster, Spring 1997, article by William Crampton. ADM 116/1847B, Use of white disc in defacing Blue and Red Ensigns. CO 325/54, Colonial Office record book of flags, 1865-1909. According to Badges of the British Commonwealth by Rudi Longueville, between 1957 and 1959 the old badge (in use since 1876) was modified (modernized). During the decade before the handover, several important, but little known, changes were made regarding the flags flown by merchant vessels registered in Hong Kong. Until mid-1980s such vessels flew British Red Ensign, but for a short period in the late 1980s a Red Ensign defaced with the Hong Kong coat-of-arms was used. Perhaps because so few people recognized the design, it was dropped in favour of a 'double flag' solution: a British Red Ensign flown above a blue Hong Kong Flag. This provision remained valid until China resumed sovereignty over Hong Kong in 1997, when the current 'bauhinia flag' of Hong Kong became the standard merchant ensign. Hong Kong was never granted a defaced Red Ensign, so the proper colours for a Hong Kong registered vessel would have been the plain Red Ensign. They could of course fly the Blue Ensign in addition to indicate their nationality, just as British vessels sometimes fly St. Andrew's flags or Red Dragons. I know that unofficial defaced ensigns were used in Hong Kong, just as they are used in the rest of the British Overseas Territories. Defaced Red Ensigns are not granted by the Admiralty (AKA MoD) but by the Department of Trade and Industry, under the Merchant Shipping Act. They are created by an Order in Council (i.e. a Statutory Instrument) rather than a warrant. Until 1990 the only official ensign for a vessel owned by an inhabitant of Hong Kong was the British Red Ensign (unless it was registered to fly a flag of convenience in which case it would have been Panamanian or whatever). In 1990 a Hong Kong shipping register was established under legislative powers granted by an Order of 1986. Vessels on the register were to wear two ensigns, the undefaced British Red Ensign above the Hong Kong Government Blue Ensign. This was not an original idea. 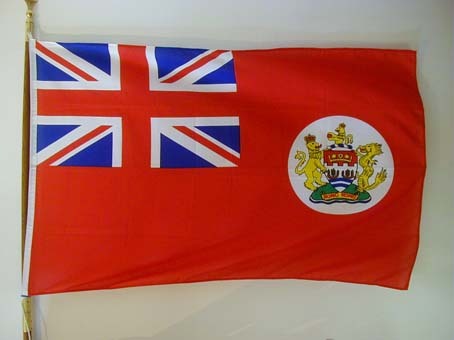 An 1890 amendment to The Queen's Regulations permitted any colonial merchant vessel to carry "a distinguishing flag with the badge of the colony thereon in addition to the Red Ensign." I have not seen any indication that this was ever done, and although repeated in The King's Regulations of 1934, it did not appear in The Queen's Regulations of 1967. The idea was not popular in Hong Kong and there was some use of the Red Ensign with the Arms of Hong Kong in the fly. It was not an authorised defacement. On a matter of terminology, only two defaced Red Ensigns have ever been authorised for colonies, and they were done in error (Victoria and South Australia). 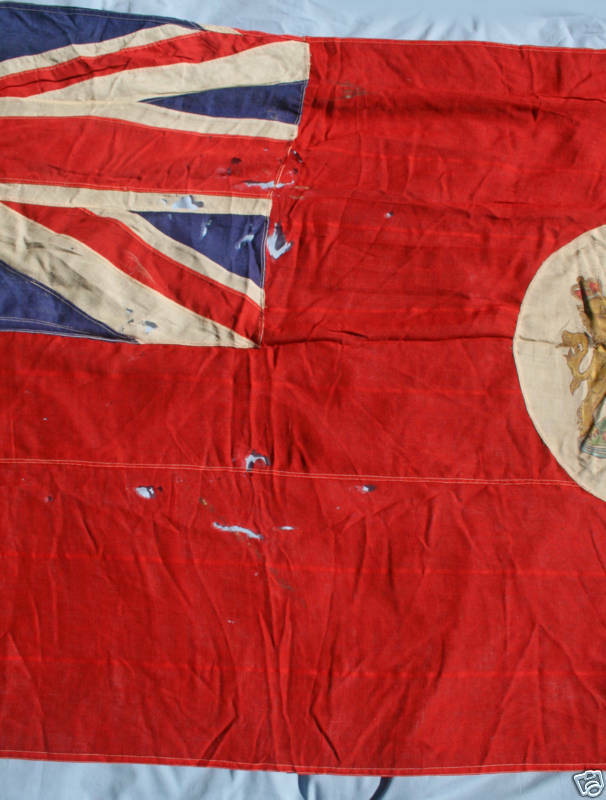 All other authorised defaced Red Ensign merchant ensigns were for either Trading Companies (British North Borneo), self-governing Dominions (Canada), Protectorates (Somaliland), Indian Native States (Kutch), Mandated Territories (Tanganyika), Crown Dependencies (Isle of Man), or former colonies after they had been designated Dependent Territories (Cayman Islands). Until 1927 defacements were authorised by Admiralty Warrant, but since then by either Royal Warrant or Order in Council. Despite being unofficial, I just bought an impressive (if tattered) antique wool HK red ensign (post 1959) measuring 8 ft long x 4 ft of rather unique sewn construction: all four corners have additional patches, the two horizontal sides are not sewn in the centre, etc. The shield of Hong Kong features a heraldic sea at the base, and above it two junks facing each other. Inside the chief (red portion) was a naval crown in gold, which, along with the 'embattled' (castle-like) design, commemorated the Second World War. For flag fans, the handover ceremony was a real bonanza thanks to the British for putting on a real pomp and circumstance show. For vexillologists, we were given a real treat as we watch all the various proceedings from the British Governor leaving his Residence and watching the Union Jack defaced with the Governor's badge being lowered for the last time to the cutover to Beijing where thousands were gathered holding both the China and the Hong Kong Special Administrative Region flags to the final hour when everyone was gathered for the formal flag ceremony. In the final minutes, Prince Charles delivered the message from the queen, a three man British contingent matched to the podium (there were 4 flag poles, 2 on the left were empty at the start) where on the right the British and the HK colony flags were flying. They were met by a 3-man Chinese contingent with the centre man carrying the Chinese flag. They took their places behind their respective flag poles. Then a 3-men Hong Kong police contingent marched up to the HK colony flag. They were met by another 3-men Hong Kong police contingent, the centre man carrying the Hong Kong Bauhinia flag. At 11.59, "God save the Queen" was played and the Union Jack and the Hong Kong colony flags were lowered and this was followed almost immediately at 12.01 with the raising of the Chinese flags and the Hong Kong Bauhinia flags.